Cue sheets will be available on-line prior to the event and at registration on the day of the event for cycling routes. As a reminder, Ride with GPS cue sheets are not accurate. Please use cue sheets given to you at registration. Cue sheets include contact information for the duration of the ride, rest stop information, instructions in case of an emergency, and other helpful event details. Please review your cue sheet BEFORE start of race. 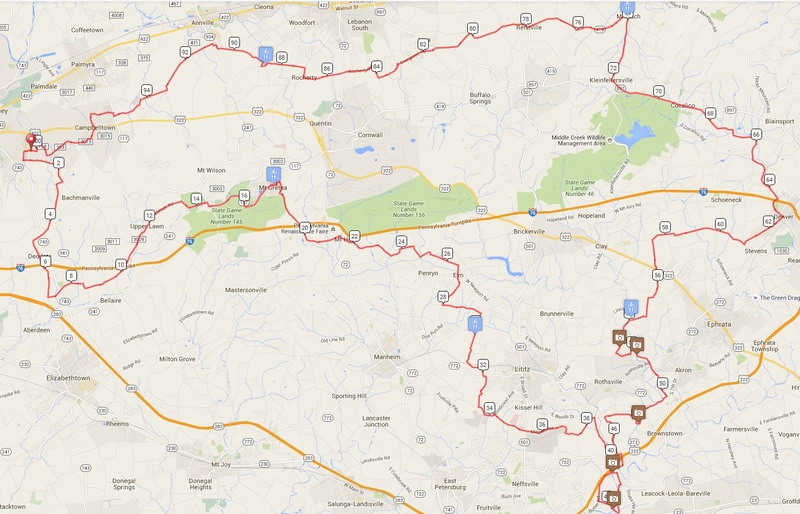 ﻿10 mile (map)-﻿This route circles the famous Milton S. Hershey School Campus in Hershey. The course is flat with a few low grade hills. This would be considered an easy course for a beginner cyclist with a total elevation gain of 482 ft. over the course. The highlights of the ride are circling the perimeter of the Milton S. Hershey School Campus with a chocolate rest stop for participants about 2 miles into the ride. The ride also passes through a very picturesque local residential neighborhood. This is a family fun ride with opportunities to enjoy chocolate and other refreshments at the rest stop and at the start/finish area. 30 mile (map)- This route is perfect for those who do not ride often but would like to cycle a distance with SAG support and rest stops along the way. The course has rolling low grade hills. This would be considered an easy course for a weekend cyclist with a total elevation gain of 1,119 ft. over the course. The highlights of the ride include riding through the beautiful Lawn Valley to the picturesque wooded Mt Gretna community. Cyclists will pass by the Mt Gretna Lake and ride between the unique cottages for which the community is famous. The rest stop at a local church in Mt Gretna will offer chocolate samples from three local chocolate factories as well as other cycling refreshments. This is a family and friends’ fun ride with opportunities to enjoy chocolate at the rest stop and at the start/finish area. The return from Mt Gretna is largely a flat ride with one short low grade climb back to the start/finish area. 50 mile (map)- This route is perfect for those who would like a few more hills but would still enjoy a mainly rolling-flat ride. This course has rolling low grade hills but also one long moderate hill with several flat sections along the climb after the rest stop in Mt Gretna. This would be considered an easy-to-moderate course for a weekend cyclist with a total elevation gain of 1,883 ft. over the course. The route travels from Hershey to Mt Gretna to Lebanon and back to Hershey, with two rest stops. The highlights of the ride include, riding through the beautiful Lawn Valley to the picturesque wooded Mt Gretna community. Cyclists will pass by the Mt Gretna Lake and ride between the unique cottages for which the community is famous. The Mt Gretna rest stop is at a local church where you will be able to enjoy chocolate samples from three local chocolate factories as well as other cycling refreshments. After the climb out of Mt Gretna, there is a long decent and flat section with rolling low grade hills in beautiful Amish farm Country with wagons and diverse farm animals. The picturesque historic towns, farms and scenery after leaving Mt Gretna are spectacular. The second rest stop is at a church in Lebanon and is followed by a fast rolling-flat return to Hershey. 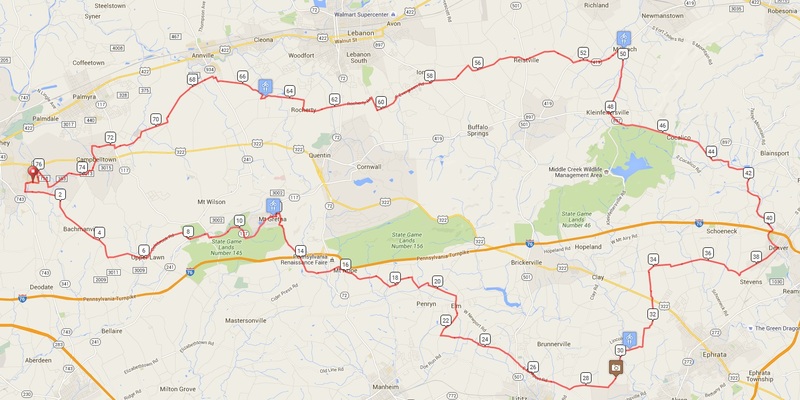 75 mile (map) - This route is perfect for those who would like to experience the beauty of central Pennsylvania with its picturesque historic towns, wooded areas, rivers, lakes, Amish farms and very diverse agricultural areas. The course has mainly rolling low grade hills but also several short climbs, with the toughest being the short climb out of Mt Gretna. There are three rest stops along the route. The ride travels from Hershey to Mt. Gretna to Lititz to Middle Creek to Milbach then Lebanon and back to Hershey. This would be considered a moderate course for a weekend cyclist with a total elevation gain of 2,805 ft. over the course. The highlights of the ride are riding through the beautiful Lawn Valley to the picturesque wooded Mt Gretna community and then into the beautiful central Pennsylvania Amish farm country with its many rivers and picturesque towns. The Amish Farm Country has spectacular views, Amish wagons and diverse farm animals. This route passes through the famous Erb’s Mill Covered Bridge, which is one of the most picturesque in Lancaster County. The rest stops are at churches in Middle Creek, Millbach and Lebanon where you will be able to enjoy chocolate samples from local factories as well as other cycling refreshments. The last 35 miles are rolling-flat and fast. 100 mile (Century) (map) - This route is perfect for those who would like to experience the beauty of central Pennsylvania with its picturesque historic towns, wooded areas, rivers, lakes, Amish farms and very diverse agricultural areas. The course is mostly flat with rolling low grade hills but also has several short climbs, with the toughest being the short climb out of Mt Gretna. There are four rest stops 20 to 30 miles apart along the route. The ride travels from Hershey to Elizabethtown to Mt. Gretna to Lititz to Middle Creek to Milbach then Lebanon and back to Hershey. This would be considered a moderate-to-advanced course for a weekend cyclist with a total elevation gain of 3,852 ft. over the course. The highlights of the ride are riding through the beautiful Lawn Valley to the picturesque wooded Mt Gretna community and then into the beautiful central Pennsylvania Amish farm country with its many rivers, historic towns and farms. The Amish Farm Country has spectacular views, Amish wagons and diverse farm animals. This route passes through five famous Lancaster County Covered Bridges, including the famous Erb’s Mill and Hunsecker Mill Covered Bridges. The rest stops are at churches in Lititz, Middle Creek, Millbach and Lebanon, where you can enjoy chocolate samples from local factories as well as other cycling refreshments. The last 35 miles are rolling flat and fast.